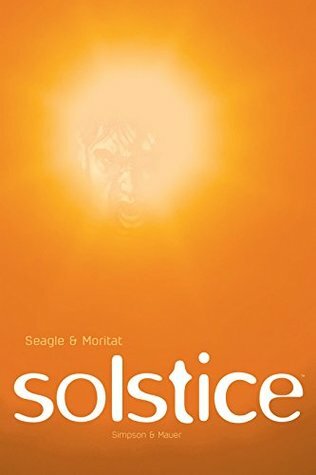 Solstice first entered the world as a three-issue miniseries in 1995 that was never finished because its publisher went bankrupt. It was completed and published as a trade paperback in 2006, but was then reworked a little, and published again as a hardcover in 2016. I've been a fan of Steven T. Seagle for quite a while, but had never noticed or heard of it until I came across it for the first time. Moritat is a great artist, although the original 2/3 of this book date from when he used to go by his actual name, Justin Norman. The book is told, in an ever-shifting narrative, by Hugh Waterhouse, who has been dragged into the jungles of Chile to search for the legendary fountain of youth. Russ Waterhouse is a truly terrible person - he's a rich bully who has dragged a number of people into his lifelong obsession, which has become more pressing since he has developed terminal (yet symptom-free) cancer. The story jumps all over the place, as Hugh describes his childhood, and two earlier expeditions to Arctic Canada and to Siberia, both of which came with great risk to his body and mind. The Chilean expedition is no different, as Russ barrels through, and the group attracts the attention of some (kind of stereotypically rendered) indigenous groups. Moritat's art is pretty nice throughout. His art reminds me a little of Tim Sale's here, which made me think a few times of his book with Seagle, The Amazon. The real draw is just how well Seagle builds up the two Waterhouse mens' characters, adding layers as he goes to make the ending a little more poignant. I'm glad I picked this up - I really enjoyed it.